"It's not nearly as cool having chickens on your farm as in your New York City backyard," Dan Feldman says. Feldman, a thirty-nine-year-old executive who lives in Ditmas Park, Brooklyn, is about to get cool thanks to a chicken coop--the Chicken Ark--designed by Australian expat Drew Waters, a TV news employee by day and Noah-like chicken coop creator by evening/night. First, there's the cachet of it. Feldman had been living in Manhattan apartments for the last twenty-one years, and just bought a house that had space for a chicken coop – something remarkable in a city in which most people live in apartments that aren't much bigger than a henhouse. Second, Feldman had, he says, "just about every other kind of pet known to existence – all manner of mammal and reptile." He didn't want to go through the drama of owning a dog again, realized his family – Feldman has kids – ate a lot of eggs, and had been reading all the buzz about backyard animal husbandry. Third, installing a coop is really just the next logical step. Feldman found Waters' company, Handcrafted Coops, to be an awesome alternative to the Eglu, which is quickly become the most popular coop for amateur backyard enthusiasts, the--"Frank Gehry-designed modernist coop," as Feldman calls it. 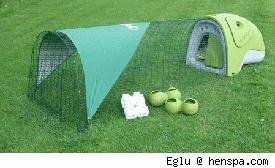 The Eglu is made of polyethylene plastic and shaped like a spaceship. Waters' coops--of which there's just one A-frame model--are the complete antithesis. "The look of the coop is based on a traditional design used by a lot of henkeepers in Britain," Waters says. "But that ark A-frame structure -- that was just a design experiment." 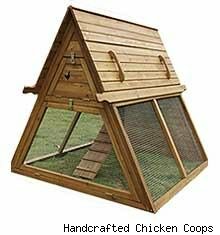 The handcrafted coop is a simple but sleek little chicken home. How did someone get from TV news to handcrafted chicken coops? For Waters, it started with the Park Slope Food Co-Op, one of the oldest in the country and a cultural touchstone for new Brooklynites. That, and the increasingly inescapable presence of what we can call the Michael Pollan School-"eat food, not too much, mostly plants"-of eating. "People are becoming more and more aware of wanting to control the source of their food," Waters says. "It was both a design desire and seeing a need that was lacking." Waters' coops are manufactured by a local woodshop and pack flat for shipping to anywhere his customers are; typically hippy places like Madison, Wisconsin; Portland, Oregon; and Austin, Texas are big on his waybills. Feldman isn't sure how his experiment is going to pan out, but one thing's for certain: it looks like we're en route to a chicken coop coup.